1. Favorite spring foundation/base product? Over the past 18 months I have been inseperable from my two favourite Clinique foundations. 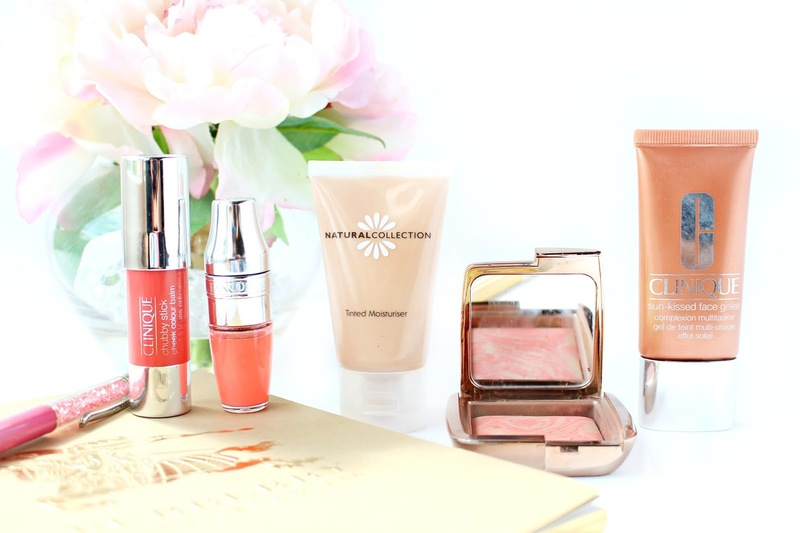 For spring the Clinique Even Better Foundation with SPF is just a dream to work with. It's light, but buildable with lovely coverage and longevitiy without making you feel at all caked! 2. What is your must-have lip color this spring? I'm really loving MAC "Shy Girl" at the moment, which is such a classic. I'm all about pretty peachy nudes during the springtime and I've totally fallen back in love with Shy Girl, which also happens to work with every single make-up look imagineable. I'm also a huge fan of the Lancome Juicy Shakers, which offer a slight swipe of colour with the benefits of an oil all in one. 3. Your favorite spring blush? shade Dim Infusion,which has been in my collection for quite a while now. It really warms up my complexion and gives me a subtle peachy glow. 4. How do you change up your make-up for spring? Even Better Foundation. I love to use the Natural Collection Tinted Moisturiser with a pea sized amount of the Clinique Bronzing Gelee, it gives such a lovely soft glow with a dash of coverage too. I also really like cream products like the Clinique Chubby Cheek Stick, which can be used in a multitude of ways for the perfect hassle free look! and summer each year. However, after trying a sample of the NEW NEOM prefume I think there might be a new spritz around this spring! 6. What spring beauty trends are you most excited about? Lighter bases and lots of pretty blush and lip shades! For spring I adore the White Company "Seychelles" and "Fresh Mint" candles. They're so pretty and litreally make me feel like I'm on holiday in a beautiful far away country. 8. What is spring like where you live? It's so beautiful! I live in the countryside and I'm lucky to have land, which means lots of fun outside when the warmer weather arrives. 9. What's your favorite thing about spring? Everything feels like its coming back to life after a long winter. There is so much promise and excitement during the spring, plus it's my birthday in spring. 10. How do you change up your skincare for spring? I tend to ease up on the heavier, waxy and balmy products when the warmer weather comes. I usually opt for gel textured products that offer lots and lots of hydration. My favourite cleanser is definitely the Oskia Renaissance Cleansing Gel and for a boost of hydration my Clinique Moisture Surge is my go to! 11. Share your spring plans! for us, which means I can't plan too much around this time of the year. I'm hoping to sneak away on a little stay-cation to Bluestone Wales and then look forward to my holiday to Dubai at the end of summer and a mini city escape towards the end of the year! I hope you enjoyed reading my spring tag!